In its fourth year of operation the Foundation has significantly increased the number of children it supports particularly in Chiang Rai, Thailand, but also in Cambodia. We have begun the year sustaining the education and primary health care of 868 children overall and have reached at year end 1364 children: 1001 children in Chiang Rai, Thailand (including preschool and kindergarten children); 80 in Lithang, (Tibet) China; 100 in Burkina Faso; and 183 in Phmon Pehn, Cambodia. In 2009 we reached out our support to 496 more children, an increase of 57% of the total number of children we are providing education and primary health care for. In addition to supporting children’s education, the Foundation builds and improves school infrastructure where needed in the villages/regions where we are present. 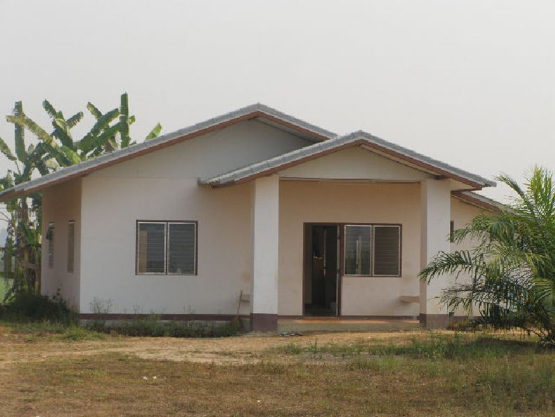 In 2009 we successfully completed two major infrastructure projects: (1) we finalized the construction of and inaugurated the Secondary School in Burkina Faso; (2) we completed the construction of a primary school in Huay Kuk, Chiang Rai. In addition, we successfully completed seven minor construction and renovation projects in Thailand for children of hill-tribe minorities: one house for professional school students, one library and computer room in a primary school, 4 rooms for teachers accommodation in a primary school, infrastructure improvements to 2 kindergartens and one nursery. there is no paid staff – the Foundation carries out its activities through the work of non remunerated Board Members and volunteers and in close collaboration with local partners. The minimum administrative and accounting and auditing fees of the Foundation, amounting to only 6118 CHF, have been covered by a 10,000 CHF donation by the Foundation’s President. The Foundation spent 600087 CHF on its projects in 2009 (including an exceptional donation of 20,000 CHF to the victims of the civil war in the Democratic Republic of Congo). Of the amount allocated to projects, 64 % was spent on sponsorships and 36 % on infrastructure. 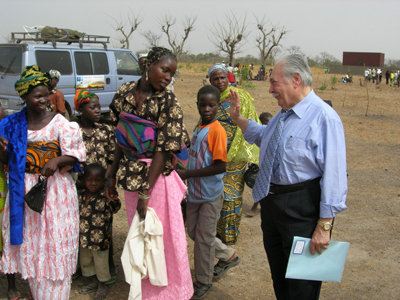 In 2009 we reached 1364 children including preschool children and completed a secondary school in Burkina Faso, and a primary school, housing for professional school students, and library/computer room in Thailand. The Foundation has continued to support for the fourth year the education, health and welfare of 100 children. The sponsorship of 310 Euros/child covers school uniforms, materials, books, one meal per day at school, a goblet and clean drinking water in school, vitamins and mineral supplements, and medical assistance, extracurricular activities such as sports, classes on hygiene, excursions, school infrastructure improvements, and furthermore activities of social workers with the community in collaboration with the parents association, such as awareness raising and education of parents on important issues from family planning to hygiene and nutrition. The sponsored children are from 4 neighboring villages in the Boulkiemdé province, and most of them from the village of Nibagdo (68 are from Nibagdo, where the Foundation had doubled the elementary school size in 2006, 3 from Bourou, 6 from Konkinnaba, 14 from Savili, 4 from Soula, 5 from Tatyou). 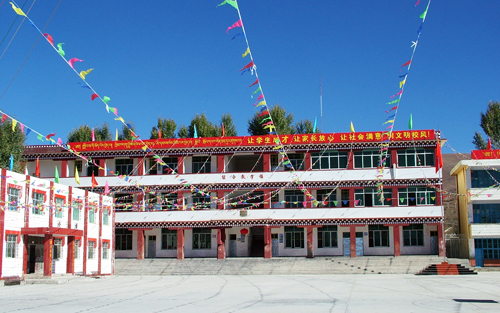 The Secondary School of Sogpelcé was completed in January 2009, as per the planned timeline. 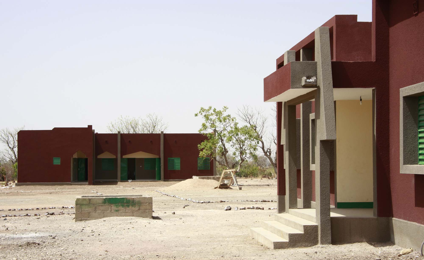 The classroom building, administration building and sanitation facilities were fully completed this year. The library and teachers’ accommodation had already been completed in 2008. 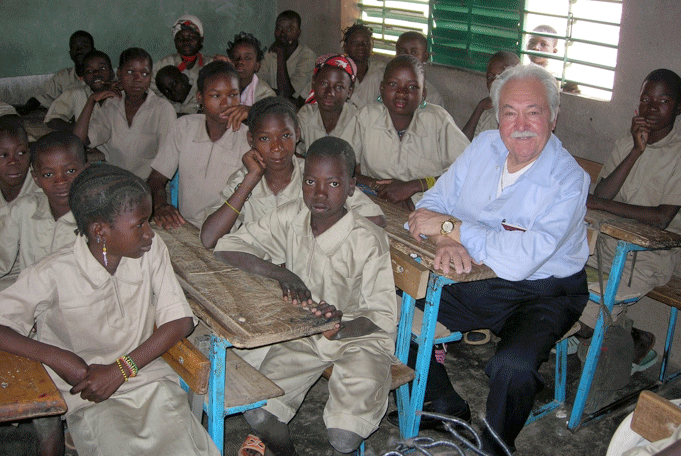 98519 Euros have been donated in 2009 as the last payment for the school. The school of 7 classes will be able to hold 490 students when all the grade levels are filled (70 students per class). The school opened in October 2008 with 76 students and with 5 teachers: Maths, French, History and Geography, Science and English. In September 2009, the number of enrolled students in the school was nearly 140. 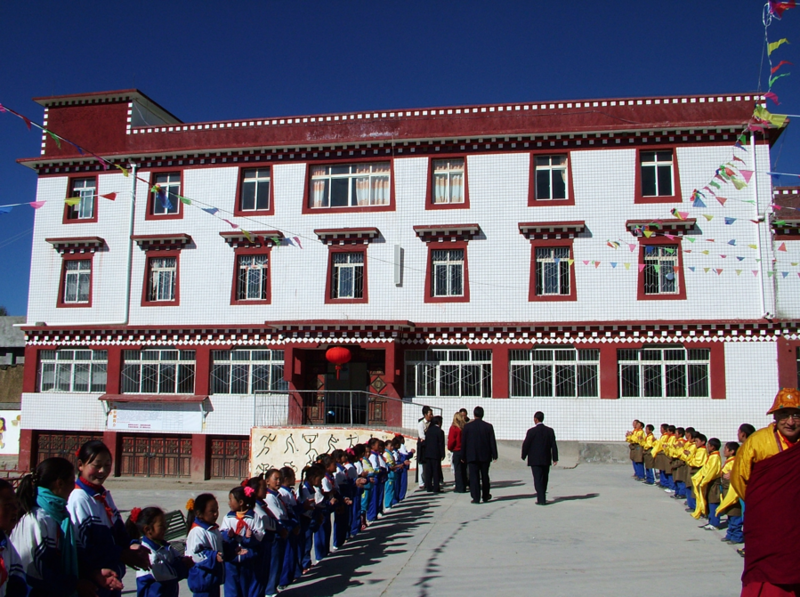 The Secondary School was officially inaugurated on February 19 in a ceremony that was widely reported in the local press. 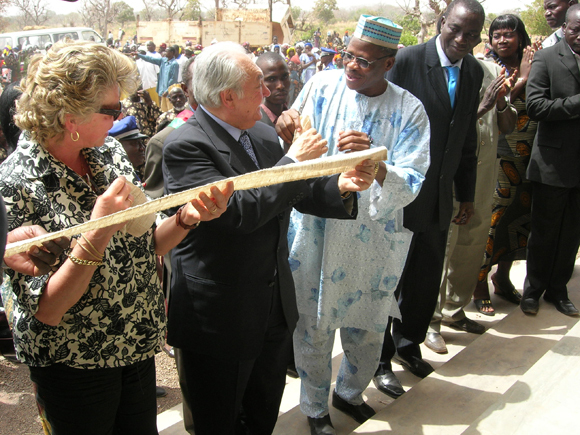 President Pasquale Pistorio, Board Member Piero Martinotti, and Valeria Dragone, President of CIAI, attended the inauguration, as well as the governor of the region, Baworo Seydou Sanou, the mayor of Thyou, Wendé Issa Gandèma, the Regional Director and the Technical Advisor of the Ministry of Secondary Education and Scientific Research, Professor Kulibila Berbard Sam and Mr Roger Tapsoba, and the director of the school Mr Paul Sayogo, as well as members of Parliament. On the occasion, Mr Pistorio was conferred a Certificate of Recognition by the Commune of Thyou “for the continuous financial support towards the development of the Commune of Thyou”. The Secondary school consists of one building of 7 classes; one administration building; one building for the library, reading room, workshop and computer lab; separate sanitation facilities; and accommodation for the school director. The school project, funded by the Pistorio Foundation, was conceived in partnership with CIAI and the Rural Commune of Thyou. The Village has built the roads to access the school from the village and oversees school maintenance. The local authorities recruit the teachers and students. During their visit, Pasquale Pistorio and Piero Martinotti visited the School of Nibagdo, where the Foundation funded the expansion of the school adding two classrooms, hangar, kitchen, and sanitation facilities. 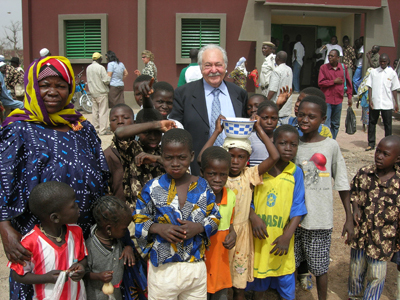 In Nibagdo, Pasquale and Piero met with students, teachers, parent representatives, and during their stay they met with regional authorities and Secondary Education Minister Professor Joseph Paré in Ouagadougou. We are very pleased with the scholarship program progress and results. 90% of the students were promoted to the next level. As the Foundation has carried forward the scholarships of 100 primary school aged children in 4 neighboring villages in the province of Boulkiemdé, the construction of the secondary school will allow its students to have access to secondary education. Secondary school enrollment and attendance rate is still very low in Burkina Faso, and particularly so in rural areas (secondary school attendance ratio for males is 17% and 15% for females according to UNICEF). One of the major reasons for low rates is lack of school infrastructure. Previously in the region there was no secondary school that was accessible by foot to the village of Nibagdo and its neighboring villages. Now, the secondary school will be within walking distance. The secondary school is already benefitting 200 children from 7 villages, so the positive impact is not only for the children we directly support but for hundreds more that benefit from this new important structure. For the fourth consecutive year, 80 sponsorships of children of nomad families were renewed in 2009. Sponsorship of 250 Euros/child covers tuition, room and board at dormitory (running costs of dormitory), three meals per day, school supplies, uniforms, and after school tutoring. These children spend the academic year in the school campus of Lithang and are housed in the dormitory that the Pistorio Foundation built in 2006. 72% of sponsorship covers room and board costs, meals, and school supplies and uniforms. 28% is used as salary supplement for the extra hours worked of the teaching staff and school directors (in total there are 2 tutors, 8 teachers and 1 president, 1 vice president and 1 director) and for the dormitory staff (cooks, cleaners, guard). Teachers and directors have a basic government salary, which is however very low and, to motivate the teachers and ensure quality education, their salaries are complemented with the scholarships funds. The staff in fact works many more hours than the regular school day, as they continue working after school to provide tutoring classes and to supervise children’s extra-curricular activities such as sports. The children and their families are very happy to have the opportunity to study in order to look forward to a better future and to be able to help their families. Before the implementation of this program, the children did not receive any education and spent their days helping their parents taking the animals for grazing on the hills at 5000 m altitude, and the older children had to look after the younger ones and help the mothers keep the tents in order. None of them had the possibility to learn to read and write because the parents are also completely illiterate. Now they can receive an education and also participate in physical activities like sports and learn basic personal hygiene. Local partner volunteer Gemma Randelli and Giovanna Giorgietti visited Lithang in the summer of 2009. The children are performing very well in school, above the national average, as indicated by their high test scores and high results in regional academic contests. They and their families are very grateful to have this opportunity. 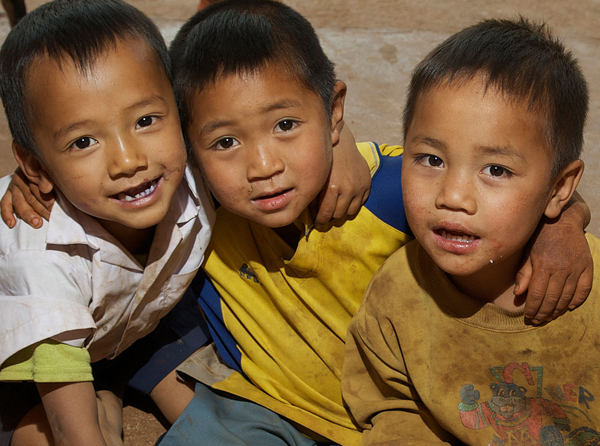 In 2009 the Chiang Rai Village Project reached out to nearly 500 more children and new infrastructure projects have been achieved. We went from supporting the education of 555 children in the beginning of 2009 to 1001 children from 13 different villages by end 2009. Of these 1001 children whose education and welfare we support, 286 are in pre-school and kindergarten, 489 are in primary school, 182 are in secondary school, and 44 are in professional school. Library Area equipped with over 500 bilingual Thai/English books (2970 CHF). Books include dictionary, encyclopedias, maths, science, history and geography books, and illustrated fiction books for children. The library is a community project – parents are encouraged to make use of the library with their children to promote family participation in the child’s education as well as to provide parents with educational reading material. Accomodation for 4 Teachers each equipped with bathroom in Ban Mhai Pattaná School. Two of these teachers, of which one is the English teacher, are supported by the Pistorio Foundation. Construction of one house on campus for girls from villages attending the VBAC Professional School in Chiang Rai (cost 200,000 Thai Baht equivalent to 6658 CHF). Currently the Foundation supports 18 students at VBAC professional School. The school is a highly qualified school in Chiang Rai providing more than 10 specialties. 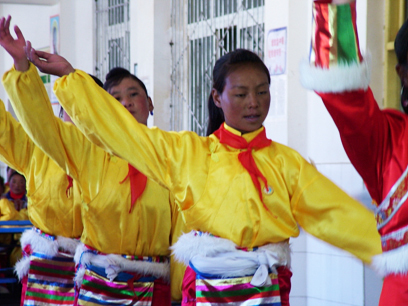 We envisage that as more hill-tribe children complete secondary school, VBAC would be an ideal choice for professional school. Having housing accommodation already in place for them will significantly reduce the scholarship fee over the years. The Chiang Rai Village Project also closely monitors the quality of education in the two primary schools built by the Pistorio Foundation. In the Ban Mhai Pattaná primary school built in 2008, we enforced the English curriculum by supplying a qualified English teacher. As the government provides only one teacher for every 40 students, we lowered the teacher/student ratio by supplying an additional teacher for the subjects of Thai, Maths, and Science. At the newly constructed primary school in Huay Kuk, teachers also teach students how to cultivate crops. Currently, the school is self-sufficient in plants, fruits, and vegetables that are consumed for the school meal. The students take care of the crops themselves. The elementary school of Huay Kuk opened its doors in May 2009, the beginning of the Thai academic year. Construction began in January and the school was ready by the end of April. The school serves the Hmong village of Huay Kuk as well as two neighbouring villages, for a total population of 828 hill-tribe people. 2 solar panels were supplied to the school by third party donors. Identified as one of the poorest villages in the region, most of the children of Huay Kuk did not previously receive an education, and were forced to live far away from home if they wanted to receive one. It is not unusual to have up to 15 members of the family living in the same hut. Huay Kuk is situated in the North East of Chiang Rai, on the border with Laos. The frontier region is considered an area of tension and is controlled by the Thai Border Police Patrol. The Pistorio Foundation has achieved the school project in collaboration with the local partner and the Border Police Patrol and local authorities. The Thai Border Patrol Police Schools are under the supervision of the Royal Thai Police Department. Charged with maintaining border security along the northern border provinces, where language barriers and cultural differences among hill tribe people and Thais are obstacles to communication, border police officers have undertaken a number of development projects, including the establishment of rural medical aid stations and schools in remote areas. Between 1956 and 2005, 713 Border Patrol Police Schools have been established and have been under the patronage of the Royal family for most of this time. 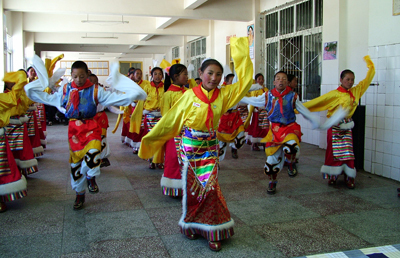 The Border Patrol Police’s efforts to provide basic education, primary and secondary schools, and vocational training schools to deprived groups, such as highland minorities and people in remote areas, has been praised by UNESCO. Normally, Border Patrol Police Schools will be transferred to the Ministry of Education if there are permanent school buildings and have a sufficient number of students. Of the 713 schools established over the years by the Border Patrol Police, 470 have been transferred to the Ministry. In 2004, there were 28,104 students in 191 Border Patrol Police Schools, comprising 177 primary schools, 12 learning centers and 2 secondary schools. Pasquale Pistorio travelled to Thailand in February to inaugurate the new primary school and dormitory completed in 2008 by the Pistorio Foundation. 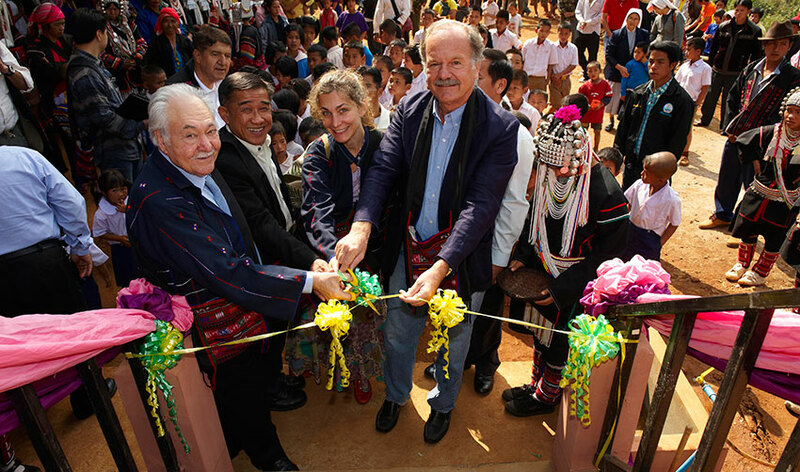 The school was inaugurated on February 9 in a ceremony attended by His Excellency Italian Ambassador to Thailand Ignazio di Pace, local project coordinator and partner Gianni dalla Rizza of the Camillian Social Center and project manager Chiwarat Dudsanee, Foundation Board Member Elena Pistorio, village head Mr. Anand Sokaku, government representative Mr. Wiwat Sokaku, and School Director Mr. Anak Takam, officially inaugurated the school campus complex built by the Pistorio Foundation in the village of Ban Mai Pattaná in Chiang Rai, Northern Thailand. Also present at the inauguration were journalist Massimo Morello and photoreporter Andrea Pistolesi, as well as Foundation volunteers Carla David, and Foundation supporter Cipolat Dae Suk Enrico. With the additions made in 2009, the primary school now consists of 6 classrooms, 5 teacher accommodations, one library and PC lab, and sanitation facilities. The school can hold up to 200 students and 102 are currently enrolled. Children follow the Thai national curriculum. The government provides two teachers (one teacher per 40 students) and the Foundation has supplemented the school staff with two more teachers. The school serves three villages of a total population of nearly 500. Children from the other two villages stay in the boarding facilities next to the school during the week as roads are very difficult to travel on, even by foot during the rainy season. Our sponsorships cover school fees, uniforms, one balanced and nutritious meal per day, school materials and books, and in some cases transportation. Children in dormitories during the week receive breakfast and dinner at the dormitory and three meals and snacks on Saturdays and Sundays if they do not go home for the week-end. 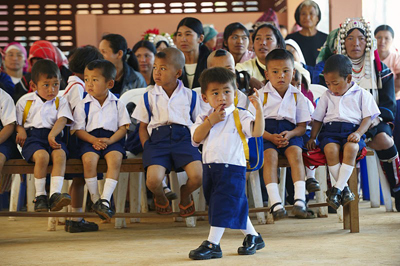 In Thai public schools children also receive yearly medical check-ups. Sponsorship varies according to grade level and is on average 145 Euros/child. 1 % drop-out rate due to migration of families. 89019 S$ were sent to Thailand in January 2009 from Singapore from the funds raised in 2008 by the Singapore Chapter. This was used to support 296 scholarships. In July 2009, 75996 Euros were donated to support 419 more scholarships (60755) and the fees to support 286 nursery and kindergarten children (uniforms, one meal per day, and school supplies). The amount raised by Singapore Chapter in 2009 was 196,091.80 S$. Of this amount 45,403 S$ was used in Q2 2009 to finance 2/3 of the construction of the Hmong Village primary school in Huay Kuk. The remaining amount of funds raised in Singapore will be remitted in first quarter 2010 for scholarships in Thailand and Cambodia. 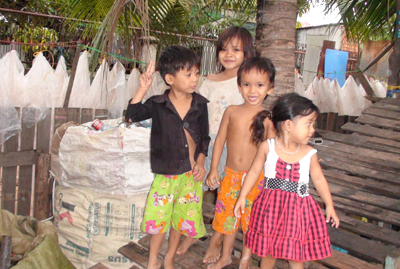 In 2009, the severe consequences of the global crisis on the poorest strata of society in Cambodia have caused an alarming growth in the number of street children and families on the brink of starvation. Municipal dump labourers that were previously living on an average of 2$ per day saw their incomes slashed by more than 50% due to the fall of prices for recyclable materials. Furthermore, widespread lay off of factory workers and general economic downturn has forced families in precarious conditions on the streets, creating a new flood of children in desperate need of support. As a result, the Pistorio Foundation has decided in the course of the year to increase the number of sponsored children in Phnom Penh. It has agreed to support the long-term education of 50 more children at the Pour un Sourire d’Enfant (PSE) centre. 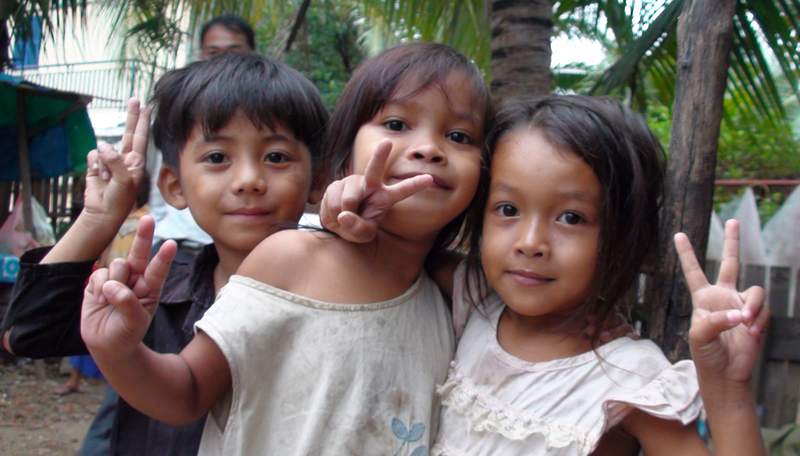 The Foundation hence currently sponsors the education of 183 children in Cambodia at the Centre de Rattrapage of PSE. Angela Mitakidis has been appointed as the new Project Manager and Auditor for Cambodia for the Pistorio Foundation. In September 2009, Angela and Mike Mitakidis together with Board Member Elena Pistorio, and volunteers Sarah Meisch and Gianluca Lionetto, undertook an audit trip to the PSE Centre in the Stung Mean Chey District of Phnom Penh, Cambodia, and interviewed families of children supported by the Foundation. PSE student (far right) with mother and sister. They live in a make shift shelter as they have been driven out of the dump area due to the relocation of the dump. They are 9 members living in one shack with no walls. 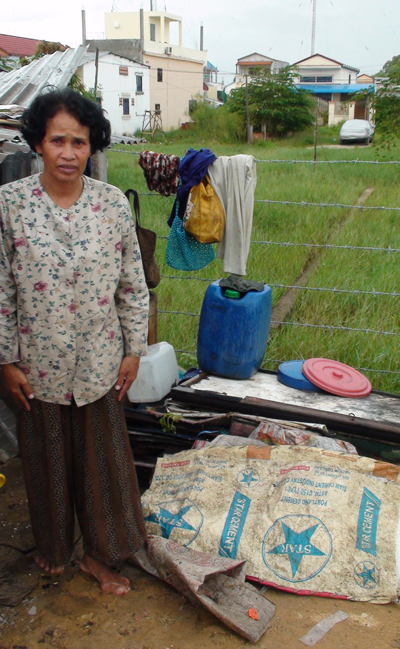 Despite the rice ration to the families, there is not enough food to feed the entire family. Only the children that are sponsored receive adequate nutrition. Such is the condition of nearly all the families supported by the Pistorio Foundation whose children attend the PSE school. The children sponsored by the Pistorio Foundation attend the Centre de Rattrapage of PSE. At this center, children follow an accelerated school program to make up for years of education lost: 2 academic years are taught in one. The center covers primary to high school education. The center also teaches traditional dance, theater, and educates on children’s rights and family, social and cultural values. The sponsorship of 432 Euros/child covers school tuition, teacher’s salaries, two meals per day, uniforms, school supplies, medical check-ups, and a ration of rice to families to compensate for the loss of income represented by the schooling of their child. These children come from families that are laborers at the municipal dump, and the children themselves were formerly workers at the dump before being enrolled at the school of PSE. 13% drop out rate mainly due to reasons related to difficult family and socio economic conditions: lack of collaboration of parents to continue sending their child to school, advanced aged students prefer to find employment, extended absences, lack of motivation to study, or family migration. All students who did not drop out of program were promoted to the next level. We whole heartedly thank all our donors and sponsors for their trust and generosity. Thank You to Maria Grazia Maraffa for donating one day of revenues from her beauty centre business “Istituto Privilège” in Ostuni, Italy, and to journalist Heidi Sarna for donating her remuneration for the article she wrote on the Foundation that was published by Expat Living in March 2009,http://www.pistoriofoundation.org/press/94.pdf . The Singapore Chapter has grown in the number of volunteers and continued its many fundraising activities throughout the year. The primary mode of fundraising in 2009 has been via events. The Chapter has held five events: Springtime Lunch of April 28 hosted by Elizabeth and Philip Badge; Charity Cocktail held at the residence of art dealers Carole and Frédéric de Senarclens in Emerald Hill, in May 2009; Tiffin Club raffles for the Bawa House ’87 Sri Lankan Hotel property launch, in benefit of the Pistorio Foundation; “A Scuola per la Vita”charity dinner of November 3; “The Jungle Book” performance in November 28 at the Singapore Repertory Theater in benefit of the Pistorio Foundation. Through these five fundraising events throughout the year the Chapter has raised nearly the same amount as the previous year, despite the very difficult and uncertain economic context: S$ 196,091. The Pistorio Foundation was the chosen charity for the year of Denise Wines and Carrot Banana Peach. In 2009 the Pistorio Foundation launched its first newsletter and Raffaella Cartledge produced a new 2.5 mn video for the Foundation of two interviews of Foundation beneficiaries in Thailand and Cambodia. The video is available on our website. Activities of the Foundation were covered in numerous issues of Expat Living throughout 2009 (http://www.pistoriofoundation.org/press/94.pdf) and by Winetalk publications of Denise Wines (http://www.pistoriofoundation.org/press/95.pdf ). Thank you also to in-kind donations of over 40 kilograms of English books and clothes that have been shipped to Thailand and Cambodia and donated by Sarah Meisch, Debbie Saliling, Michelle Morton, Sharoff Guarino, Elena Pistorio, among others.